There are several things we can do to feel better about ourselves, to live a more harmonious life, such as physical exercise, breathing fresh air, having a healthy and diversified diet, being surrounded by loved ones, etc. Unfortunately, physical pain can also be part of our lives. Nature is fascinating and can bring us a part of the solution to lower our physical pain. Here, we will be presenting you different foods that have some anti-inflammatory properties and may help decreasing pain levels. Cinnamon has a long storied history with mankind. It has been used since the remote antiquity. It is one of the spices which contains the most antioxidants. The “true cinnamon” comes from the Cinnamomum verum tree. It is mainly cultivated in Sri Lanka, Bangladesh, Burma and the Malabar Coast. The spice comes from the bark inside of the cinnamon of Ceylon tree. Usually, the cinnamon we buy in the grocery is the “common cinnamon” that is derived from related species of trees also referred to as “cassia” or Chinese cinnamon. The healing properties of the “common cinnamon” are not as effective as the ones from the “true cinnamon”. Ceylon cinnamon can helps to stabilize blood sugar levels. It can be an interesting ally for those living with diabetes. A study reveals that with as little as two teaspoons per day we can reduce blood glucose levels by 20-30% (tested with diabetes type 2 patients). It can also lower LDL cholesterol and triglycerides. 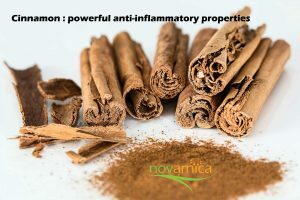 The “true cinnamon” contains powerful anti-inflammatory properties that can help relieve the pain and the stiffness in muscles and joints, including arthritis. The cinnamon also seems to have a positive effect on the functioning of the brain. It can also reduce the inflammation in the blood vessels which can lead to atherosclerosis and heart disease. It has antifungal and antibacterial properties. Try to add cinnamon to your smoothies, yogurt, healthy cooking recipes, oatmeal, mixed with berries, or as a healthy supplement in your coffee or tea.